It's hard to keep up with an illustrated journal/calendar, but totally worth it. It's hard to keep up with every task we should repeat every day. This looks worth it as you say! It keeps creativity going for sure! I love this way of keeping a journal, that you seem to have a blank book but put in the dates yourself, what a great idea. this is so inspiring! love your work! btw your blog is actually one of the first blogs i started reading and is a constant inspiration for my art. thanks, friend. Helen, Ann and Ilene---Thank you so much for your kind words! Oh wow. So impressed & I bet it's so much fun to look back on. Becky, Danielle,Fados... thank you all so much! It is lots of fun to go back. And surprising to see how fast time passes. Awesome, I started one too, but only for sketches not necessarily a calendar. Would love to know what kind of sketching implements you are using for the color. 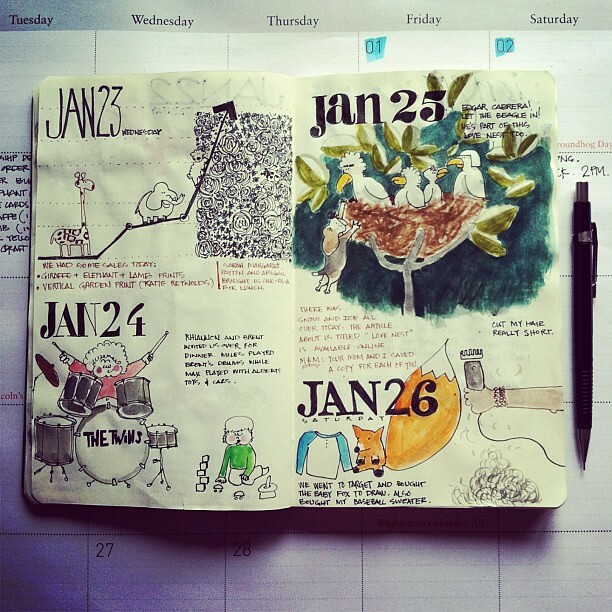 Love this kind of journaling. You've inspired me to restart my effort.